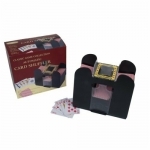 Why shuffle your cards the old-fashioned way, when you can use one of these high-quality card shufflers to ensure that your playing cards are thoroughly and randomly shuffled. 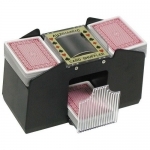 Both manual (hand-cranked) and automatic (battery operated) card shufflers are available. These card shufflers can handle anywhere from one to six decks, using standard paper cards, or the increasingly-popular plastic playing cards. Machine-shuffled cards are mixed more thoroughly than hand-shuffled cards, and without risk of bending, tearing, or scuffing your favorite deck of playing cards. Prices shown are accurate as of Dec 23, 2017 18:14pm CST. Please follow the links for current pricing.